The creation of a paleohydrologic record for the Hawaiian Islands is essential to understanding future implications of climate change. Determining the oxygen isotope composition of diatoms present in Lake Waiau cores will allow the paleohydrology of the lake to be reconstructed, which can be related to the hydrologic history of the entire Hawaiian Islands. Prior to the isotopic analysis of the diatoms, they must be isolated from the rest of the sediment. This study attempts to determine an effective method for this isolation, as well as to identify the diatom species that were isolated. Many isolation methods were tested, and a protocol was created which consists of: (1) oxidation of organic matter using HNO3, (2) removal of iron oxide, (3) sieving over a 45&micro;m sieve, (4) differential settling, (5) filtering, and (6) SPT separation at 2.1sg. This protocol does not completely isolate the diatoms, but it is the best method based on the tested techniques. Diatom samples from three depths in the core (38 cm, 90 cm, and 99 cm) were viewed under the scanning electron microscope (SEM). Through the use of SEM, three species were identified in the samples: Pinnularia abaujensis var. abaujensis at all three depths, Hantzschia amphioxysis at 38 cm and 90 cm, and Nitzschia frustulum at 90 cm and 99 cm. The work completed by this study is the precursor to the future isotopic analysis of the isolated diatoms. Given that few paleoclimatic studies have been done on the Hawaiian Islands, there is a lack of a high-resolution paleohydrologic record for the region. Lake Waiau, an alpine lake on Mauna Kea, Hawaii, contains diatomaceous sediments that can be used for the creation of such a record (Massey 1978). This study completes preliminary work towards future research that will create a distinctive record for Lake Waiau. The record will be produced by determining the oxygen isotopic composition (&delta;18O) of biogenic silica in the diatom's two-valved shell, the frustule. The &delta;18O of the frustule is mainly influenced by the &delta;18O of the lake water at the time when the shell is formed. Lake Waiau is unique in that the &delta;18O of the water is regulated solely by changes in precipitation and evaporation through the different seasons. Precipitation decreases the &delta;18O of the lake water, and evaporation increases the &delta;18O of the lake (Ehlmann et al. 2005). Precipitation is the lake's only influent, so the isotopic composition of the diatoms reflects the amount of precipitation and evaporation on the lake. This study's generation of a method for the isolation and ensuing identification of the diatoms in the sediments is the first step towards creating a paleoclimatic record for Lake Waiau. Due to the fact that isotopic analysis will release oxygen from all components in the sample, including contaminants, complete isolation of the diatoms is essential. Residual silt and clay particles will cause lower than normal &delta;18O values (Morley et al. 2004). Previously published &delta;18O anomalies attributed to climatic transitions show variations of only 10, while different levels of contaminant removal can cause much greater &delta;18O shifts (Morley et al. 2004). Therefore, even small levels of contamination in the isolated diatoms can lead to highly skewed data. In addition to recording &delta;18O variations, diatoms are very sensitive indicators of change in lake-water chemistry. Hydrochemical variables, such as conductivity, pH, and dissolved ions, affect what diatom species are present in the lake's assemblage (Gasse et al. 1995). This study's characterization of Lake Waiau's diatom assemblage over time can assist in determining past hydrochemical conditions. The results will prove useful in determining how to perform future diatom isolations and in yielding new knowledge on diatom species present in Lake Waiau sediments. The two primary objectives of this research are to 1) isolate the diatoms from the Lake Waiau core, and 2) identify the diatom species present. Numerous isolation methods were performed, mostly based around the protocol outlined in Morley et al. (2004). Adaptations of the protocol and additional techniques were employed to try to isolate the diatoms as fully as possible. The isolated diatoms were analyzed with a scanning electron microscope (SEM) for identification. The most effective method for diatom isolation, which will be identified by this study, can be employed in future Lake Waiau research. The second aspect, the successful identification of the diatoms, will presumably serve as a basis for the creation of the complete diatom assemblage. Isolation of Diatoms Removal of organic material: Removal of organic material was the first step in the isolation. Three different methods were employed: oxidation with H2O2, oxidation with HNO3, and ashing the organic material by heating the sample at 550&deg;C. For the H2O2 treatment, 25 ml (per 2.5 g of sediment) of 30% H2O2 was added to the sediment and put on the hot plate at 100&deg; C for 2 hours. If the peroxide reacted strongly, the beaker was removed from the hot plate so that it would not bubble over. Following the H2O2 reaction, the sediment was always washed thoroughly in centrifuge tubes with distilled water. The second method, nitric acid treatment, was completed overnight with 2.5 g of sediment treated in 25 ml of 8N HNO3 at 60&deg; C. The sediment was then washed the next morning. The final method involved "ashing" (i.e., heating) the sediment overnight at 550&deg; C. Exposing the sediment to high heat should have burnt off all remaining organic matter. Removal of Iron Oxide: A protocol to remove iron oxide Fe2O3 was performed. This process served to disaggregate any clumps of clay particles that hindered later isolation techniques. The first step was to add 40 ml of a 0.37 M Na-citrate solution and 5 ml of a 1 M NaHCO3 solution to 1 g of sediment. The mixture was then heated to 80&deg; C in a water bath. 1 g of NaS2O4 was then added with one minute of stirring. For the next 15 minutes the solution was stirred occasionally. The sample was removed from the water bath and left for another 15 minutes. The solution was then washed with distilled water in centrifuge tubes. To totally disaggregate the clays, a Calgon&reg; treatment was performed. A 0.05% solution of Calgon&reg; was added to the sediment, which was then boiled for 15 minutes. After being diluted to a total volume of 500 ml, the beaker was placed in the sonic bath for three minutes and then allowed to settle. The supernatant containing the diatoms was decanted. Sieving/Filtering: Sieving the sample between 75 and 10 &micro;m sieves was done to remove detrital particles (Morley et al. 2004). Sediments were sieved to obtain the fraction between 63 and 10 &micro;m, presumably catching all diatoms on the 10 &micro;m mesh, with most silt and clay particles caught above the 63 &micro;m sieve and below the 10 &micro;m mesh, respectively. A handmade 10 &micro;m mesh "sock" was used to expedite the sieving process. It was determined that putting both the sediment to be sieved and the mesh sock in a sonic bath assisted in breaking up some sediment masses and kept the sediment suspended in the sock. Because some of the diatoms are very small and passed through the 10&micro;m mesh, sieving over this pore size was unproductive. As a result, the size range of the samples was reduced by using a 45 &micro;m sieve alone. With the intent of retaining the grain sizes of the diatoms and discarding smaller detrital grains, many different filters were tested. The sediments were filtered over 5 and 10 &micro;m polycarbonate, 8 &micro;m mixed cellulose and ester, and 2 &micro;m fiberglass filters. Differential Settling: In this step, the diatom fraction was centrifuged at 1500 rpm for four minutes with distilled water. This caused the remaining silt to settle and form a separate layer faster than the slower settling diatoms. The supernatant containing the diatoms could then be decanted using a pipette. The differential settling process was repeated until there was no diatom layer remaining. Alternately, the settling step could have been done without using the centrifuge. In this "bench-top" method the sediment, along with 75 ml of distilled water, was left to sit in a beaker. The upper diatom layer (about 45 ml) was decanted every 10 minutes, replaced with fresh distilled water, and inspected under the light microscope. This process was repeated until a high concentration of diatoms was no longer observed in the decanted portion. Heavy Liquid Separation: The remaining contaminant grains were subjected to heavy liquid separation. Sodium polytungstate (SPT) was prepared at 2.1 sg. The sample and SPT were centrifuged for 20 minutes, after which time the floating diatoms were removed. If a lot of sediment was floating in the supernatant along with the diatoms, more water could be added to lower the density of the SPT, and the centrifuging repeated. The final supernatant was vacuum filtered (using a .45 &micro;m filter) and washed with distilled water. At this point, the diatom fraction could be left to dry on the filter and mounted onto an SEM stub. For all of the above methods, the diatom portions of the samples were viewed under a light microscope to determine the success of the techniques. When a sample was found that had a significant diatom concentration, it was prepared for the SEM. The millipore filters containing the isolated diatoms were attached to SEM stubs using double-sided conducting tape. Prior to examination, the stubs were carbon-coated. A Zeiss DSM 962 SEM was used to obtain high magnification images of the diatoms for identification. SEM analysis at 20 kV was done on samples at 38, 90, and 99 cm. Various combinations of the above methods were employed in an attempt to fully isolate the diatoms. None of the trials resulted in a product that was purely diatoms, however some approaches were found to be superior to others. Treatment with nitric acid was found to be both the easiest and most successful means of removing organic material, and was used in the majority of the trials. Using peroxide as a means of oxidizing the organic material was rejected because washing peroxide off of the samples proved to be quite difficult due to the bubbling of the solution. On the other hand, most of the nitric acid could be washed off after just one centrifuging. Ashing the organic material was deemed a poor method, because it was suspected that it alters the diatoms prior to &delta;18O analysis. The removal of iron oxide was effective in disaggregating clays. Upon inspection under the light microscope, the sediments had far fewer detrital grains than the samples not subjected to the protocol. The success of this step indicates that there was originally a lot of iron oxide in the sediments. This is was expected due to Lake Waiau's proximity to the volcano . Following the removal of iron oxide, the sieve step was essential in removing larger sized grains. As for the elimination of smaller grains, sieving for the portion greater than 10 &micro;m was problematic because small diatoms tended to pass through the mesh. Filtering was not very straightforward. A lot of variation in diatom size was found at different depths in the core. Therefore, for any given sample, some filters were more effective than others at capturing diatoms and removing residual grains. Many times, the sediments would clog the membrane filters, and things that should have passed through did not. In general, the most functional filter was that with the smallest pore size that did not get clogged with sediment, so that it allowed the smaller silts and clays to flow through. Depending on the composition of the sample, the most effectual filter ranged in size from 5-10 &micro;m. In an attempt to expedite the filtration, Calgon&reg; was employed to try to disaggregate clays. When filtering sediment treated with Calgon&reg;, there was not much of a difference observed in the degree of clogging. The next method, differential settling, did not result in two completely separate silt and diatom layers, but it removed a lot of extraneous material from the system. Differential settling was more efficient and completed more quickly using the bench-top method without centrifuging. SPT separation at 2.1 sg also removed a lot of non-diatomaceous material from the system. Three of the diatom species found were identified based on images and descriptions in existing literature (Dodd 1987; Patrick and Reimer 1966; Round et al. 1990). The species were identified based on the shape and size of the frustule (the shell), the number and orientation of striae (the rows of pores or punctures in the frustule), the structure of the raphe (a slit along the long axis of the valve), and any other specialized structures associated with the particular genus. In addition to the species identified via SEM, a variety of diatom species were observed in samples from different depths when viewed under the light microscope. The SEM images acquired made it easier to determine the identity of some of these species. The first species found in the core was Pinnularia abaujensis var. abaujensis (Figure 1). This species is characterized by a linear-lanceolate valve shape with rounded ends. It has a large axial area, and a central area that extends to the valve margin. The species has a raphe on both valves, with hook-shaped terminal fissures that both bend in the same direction. The striae number 11 in 10 &micro;m. They radiate at the center and converge towards the ends. Short striae can extend all the way around the ends of the valve (Figure 2). The valve dimensions are: length 64 &micro;m and width 10 &micro;m (Patrick and Reimer 1966; Dodd 1987). Pinnularia abaujensis var. abaujensis, the primary species present at 38 cm, was also noted at 90 and 99 cm, and seen through the light microscope at 22 cm and 50 cm. The second species found was Hantzschia amphioxys (Figure 3). The valve shape is linear-lanceolate with moderate dorsiventrality, so that the top and bottom valves can be easily distinguished. The ends of this species can be described as capitate. The diatom has large fibulae. The raphe is marginal and located on the same side of both valves. The valve dimensions are: length 47 &micro;m and width 8 &micro;m (Dodd 1987). Hantzschia amphioxys was found at 38 and 90 cm, and recognized through the light microscope at 74 cm. The final species identified was Nitzschia frustulum (Figure 4). It has an elliptic-lanceolate valve shape with subacute ends. It has a marginal keel, a raphe which protrudes above the valve face, located on opposite sides of the two valves. The striae and fibulae (struts in the raphe) are very distinct. This species has valve dimensions: length 14 &micro;m and width 3 &micro;m. Striae are 30 in 10 &micro;m, and fibulae are 11 in 10 &micro;m (Dodd 1987). Nitzschia frustulum was found at 90 and 99 cm. It was very identifiable with the light microscope, and was spotted at 22 cm, 50 cm, 70 cm, and 74 cm. In addition to the three species described, an unidentified centric diatom with a diameter of 9 &micro;m was observed at 50 cm and 90 cm. 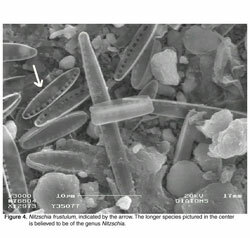 Figure 4 shows a second unidentified diatom species. It is suspected to be a member of the genus Nitzschia. This research attempted to fully isolate and identify diatoms from Lake Waiau sediments. A complete method for the total isolation of the diatoms was not developed, but a scientific working protocol has been compiled, including commentary on techniques that do not work. The working protocol consists of: (1) oxidation of organic matter using HNO3, (2) removal of iron oxide, (3) sieving over a 45 &micro;m sieve, (4) differential settling, (5) filtering, and (6) SPT separation at 2.1 sg. Modification of the procedure is necessary to increase the diatom concentration of the final, isolated sample. Future work dedicated to improving the protocol should focus on the testing of additional sieves and filters. The size variations in both the diatoms and the detrital grains present in the sample made a complete separation difficult. It was found that the diatoms did not have a consistent size throughout different depths in the core, and that they fell in the same range as the grain sizes of many of the other particles. Therefore, the same isolation method may not work at all core depths. In addition, some parts of the core are more diatom-rich than others. A lower diatom concentration makes isolation of the diatoms more difficult. This may lead to inconsistency in the success of the isolations at varying depths. Over the three depths in which SEM analysis was performed, three species (Pinnularia abaujensis var. abaujensis, Hantzschia amphioxysis, and Niztschia frustulum) were identified. As more isolations and SEM analyses are completed, variations in the diatom assemblage at different depths will be documented. Changes in the diatom assemblage will indicate deviations in the hydrochemical conditions of Lake Waiau at different times in the lake's history. Massey (1978) previously documented eight diatom species in Lake Waiau cores. Two of these species, Hantzschia amphioxysis and Nitzschia frustulum, were identified in this study. Massey (1978) located Nitzschia frustulum throughout the core and Hantzschia amphioxysis between 70 and 100 cm. The 38 cm sample analyzed in this study was sieved over a 10 &micro;m mesh, which Nitzschia frustulum is able to pass through. Therefore, Nitzschia frustulum was not observed in the 38 cm sample from this study. However, evidence of Hantzschia amphioxysis was found at this same depth, which Massey (1978) had not formerly recorded. The main species documented in this study, Pinnularia abaujensis var. abaujensis, has not been previously recognized in Lake Waiau. While the SEM analysis is very informative, it is impossible to view every diatom in the sample using the microscope. Hence, some species are inevitably overlooked in the analysis. The steps taken in this research lay the groundwork for an eventual isotopic analysis of the isolated diatoms. Such an isotopic analysis will makes it possible for a high-resolution hydrologic history for Lake Waiau to be created. Having such a record of past climatic conditions will be an important step towards predicting climate change in the future. The authors gratefully acknowledge support from NSF grant #023600 and the University of Hawaii Sea Grant College Program . The authors would also like to thank James Cowen for the use of his SEM, and Kristen Mailheau for her assistance. Dodd J. (1987). The Illustrated Flora of Illinois. Southern Illinois University Press. Ehlmann BL, et al. (2005). Hydrologic and isotopic modeling of alpine Lake Waiau, Mauna Kea, Hawaii 59. Pacific Science No 1. Massey JE. (1978). Lake Waiau: A study of a tropical alpine lake, past and present. University of Hawaii, Manoa, Hawaii. Morley DW, et al. (2004). Cleaning of lake sediment samples for diatom oxygen isotope analysis. Journal of Palaeolimnology 31, 391-401. Patrick R and CW Reimer. (1966). The diatoms of the United States, exclusive of Alaska and Hawaii 1. Academy of Natural Sciences of Philadelphia Monograph No. 13, 688. Round FE, et al. (1990). The Diatoms. Cambridge University Press.